Astigmatism is an optical aberration that is caused by the cornea being shaped oblong more like a rugby ball than the normal round shape such as a baseball. Usually astigmatism is hereditary: many people are born with an oblong cornea, and the resulting vision problems may get worse over time. Astigmatism may also result from eye injury that caused scarring on the cornea, from certain types of eye surgery, or from keratoconus, a disease that causes gradual thinning of the cornea. It is not uncommon for the majority of eyes to have a bit of astigmatism. It is most likely to be associated with short or long sight. Both children and adults can have astigmatism. Unfortunately, astigmatism can affect the ability to see well in school or during sports related activities. Yearly eye examinations are key to the detection of astigmatism in both children and adults. If you have a slight amount of astigmatism you may not notice it at all. In some cases, uncorrected astigmatism can produce headaches, eyestrain and blurred vision at all distances. Astigmatism can only be detected during an eye examination by the optician. However, a corneal topography scan will provide more in-depth information on the nature and the degree of astigmatism. Astigmatism can usually be compensated for by wearing eyeglasses or contact lenses. Previously, people with astigmatism believed they would not be able to wear contact lenses, this was true many years ago however; technology has produced soft toric contact lenses that have a special correction built into them for both nearsighted and farsighted vision. Depending on the type and severity of your astigmatism, you may also be able to have it corrected with refractive surgery. In patients undergoing cataract surgery, any pre-existing astigmatism can now be successfully corrected by implanting toric premium lens implants during cataract surgery. What Are Toric Premium Lens Implants? Toric Premium Lens Implants are a type of lens implant for cataract patients that are designed to correct astigmatism, resulting in better uncorrected visual acuity. For cataract patients who have a significant amount of astigmatism, and who do not wish to wear eyeglasses to see clearly at a distance, choosing a Toric Lens Implant can help them be independent of glasses for tasks such as driving, that require clear distance vision. 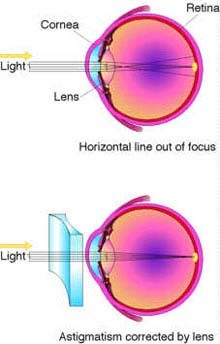 The Toric Lens Implant does not correct presbyopia, the inability to focus naturally from near to far distance. After cataract surgery, patients that receive the Toric Lens will still require reading glasses or bifocals to be able to comfortably perform near vision tasks such as reading and intermediate tasks such as computer work. If you have a considerable amount of astigmatism, Mr. Srinivasan and staff will discuss Toric Lens Implants with you, as this type of premium lens implant may be a good option for providing you with the best possible vision without needing eyeglasses to see at distance after your cataract surgery.